What is Mac OS X 10.10 Yosemite? OS X 10.10 refers to the 2014 version of operating system exclusively unveiled at WWDC 2014 permitted to run on Mac computer by Apple Inc., after OS X 10.9 Mavericks. Name: Before the announcement, earlier rumors said that the internal codename of the new Mac OS would be 'Syrah' - a type of red wine, or would be named as 'Napa Valley' or 'Napa' for short"; some think it is not named after an animal, different from previous versions. Now, the codename is officially confirmed as Yosemite for Mac OS X 10.10, based on a picture of the rock face of El Capitan that appeared on a poster at the event. Version: The version of next OS X has been decided to be 10.10, not 11.0. It is the tenth 10.x update. Availability: Now that Mavericks is made the first free major OS X update, will its successors follow suit? We guess yes. In this sense, the existing Mac users can use all new functions for free. Actually, Apple has already confirmed that the next version of OS X will be available for registered developers. What Do Most People Want from OS X 10.10 Yosemite? According to research and survey on social media like Twitter, many people tend to claim Siri (Plain Voice Interaction), AirDrop or useful apps as the new features of OS X 10.10 Yosemite. But from deep inside, there is a demand that has yet disclosed – ripping DVDs on Mac OS X 10.10. Apart from working and business, a Mac, similar to Windows PC, is mostly used for catering to our digital lifestyle. So it includes some useful app such as iLife suite. For people who need to play DVD videos on Mac (or other Apple device) without inserting a DVD in, a OS X 10.10 DVD ripper is also needed by a consider number of Mac users. What is The Best DVD Ripper for OS X 10.10 Yosemite? -	Fastest speed: the kernel perfectly compatible with Yosemite makes the DVD copy speed even faster, let alone the original 8 core processor support and Hyper-threading technology. -	Powerful DVD compatibility: With unmatchable copy protection removal ability and frequent updates, it catches up with almost all new movies and other commercial DVDs. -	First-class output quality: With High Quality Engine, it keeps the original video audio effect to the utmost during convert DVDs on OS X 10.10 Yosemite. Fast rip any (unprotected and copy-protected) DVD to iMovie on macOS Mojave, High Sierra, Sierra and so on. How to Use the Best OS X 10.10 Yosemite DVD Ripper? For Mac users, ripping DVDs on Yosemite is the first and crucial process before they play DVD videos with more media players on Mac, iPhone, iPad, iPod, Apple TV and so on. To achieve all these, one may need to free download the best DVD converter for Mac OS X 10.10 Yosemite. 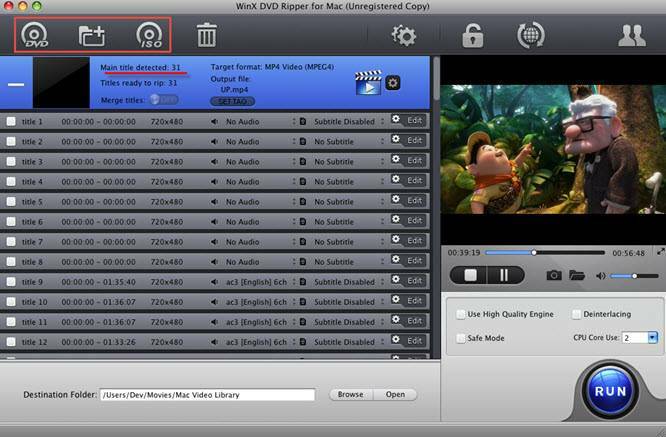 Once downloaded, WinX DVD Ripper for Mac will go good with your new Mac OS without updating. Install and launch it. Similar to ripping DVD on Mavericks, it is as easy as A-B-C.
Insert a disc into your Mac, and click the "DVD" button on the left top of software UI to load your DVD content. Alternatively, you can add a DVD folder or ISO image file from your hard drive. The Yosemite DVD ripper will check and choose the main DVD title (always the longest) for you immediately when the Output Profile Window overlaps it. In this moment, you are enabled to choose an idea output format according to your needs. It supports converting DVDs to any Mac and PC friendly videos or playing the videos on iPhone 6/6 Plus/5S/5C, iPod Touch, Apple TV 3, iPad Mini with Retina Display, iPad 5 (i.e. iPad Air), Android tablets, smartphones, PSP and so on. The software allows you to change the Destination Folder to save the output digital file, or make advanced parameter settings, etc. But all are optional. Afterwards, you may simply hit the RUN button on the bottom. For any feature-length movie, it takes less than half an hour to complete the process, but it also depends on the configuration and situation of your Mac, as well as the output format you choose. Rip DVD to iMovie, iTunes, iPhone, iPad, iPod Touch, Apple TV etc, as well as other devices, like Samsung, Huawei, Xbox, PS3/4 and more with high quality. Here's tutorial of how to rip/convert a DVD on Mac computer without DVD optical drive like MacBook Air, Mac Mini using the best DVD ripper for Mac. This tutorial will tell you how to convert DVD to iTunes video, import DVD movie to iTunes library, and sync DVD movies from iTunes 12.8 to iPhone iPad Apple TV etc. WinX DVD to iPhone Ripper is a professional DVD to iPhone converter to help you decrypt/convert/rip DVD first, and then play DVD on iPhone XS/XS Max/XR etc. Part 1What is Mac OS X 10.10 Yosemite? Part 2What is The Best DVD Ripper for OS X 10.10 Yosemite? Part 3How to Use the Best OS X 10.10 Yosemite DVD Ripper?